uilt on the basis of Yuan Dynasty City Wall. 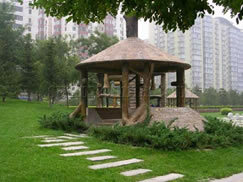 Yuandadu Relics Park is a key scenery project for Beijing Olympics Games. Divided into Haidian Section and Chaoyang Seciton. 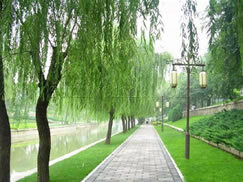 It is the largest band shaped park in Beijing with a total length of 9 km. Giant group statues of 19 historical figures like Kublai Khan. 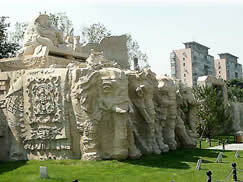 Imperial Concubine and Italian traveler Marco Polo represent the “Prospenity of Dadu” in the form of earth city. 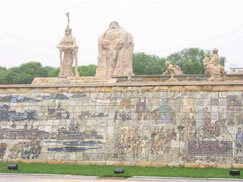 Group statue” Prospeity of Ddu” has become the largest group statue in Beijing, its hamony with earth city makes Yuandadu City Wall Pelics Park a large group statu in Beijing. Its harmony with earth city makes Yuandadu City Wall Relics Park a large size “ open air art museum” It is also a urban park with the function of disaster prevention and refuge function. Located in the south of Olympic park . Yuandadu City Wall Relics Park will, after its completion, be in hamony with Olympic Park with its style of green sites history, human culture and high tech environmental protection and become the first sights for People"s Olympic.